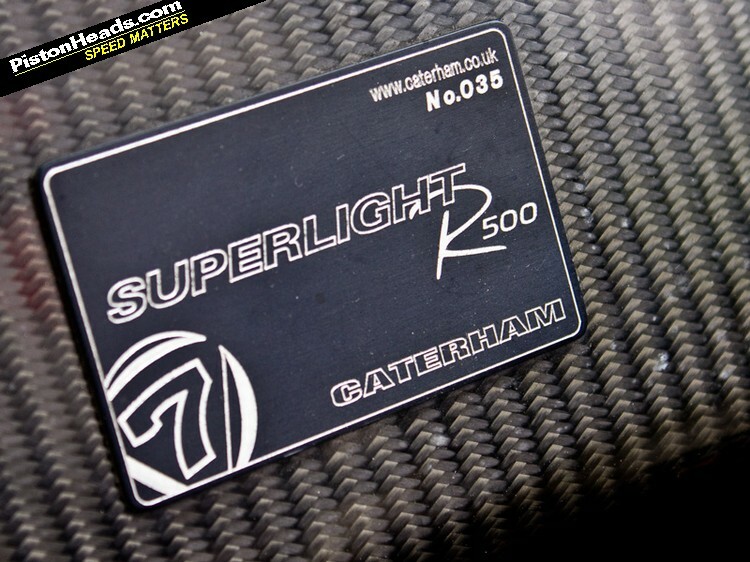 Contrary to the stickers, this is not a Caterham R500. 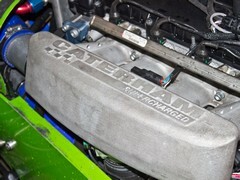 The normal Caterham R500 powerplant is a hand-built Caterham Powertrain (CPT) version of the ubiquitous 2.0-litre Ford Duratec. And it might well be a work of art, with its roller barrel throttle bodies, but it's been unceremoniously ripped from the front of this car. 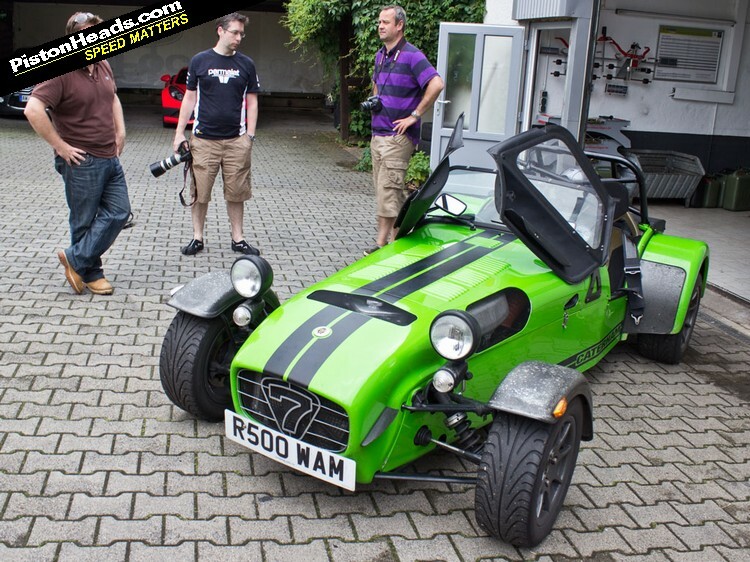 What was once the official factory R500 demonstrator is now a rolling test bed for a brand new supercharged powertrain. 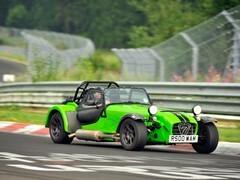 This green car is now a road legal development test bed for next year's race cars and just part of new boss Graham Mcdonald's future plans for Caterham. Like that Colin Chapman's Seven is still, to this day, one of the most important sports cars ever built. As the years roll by, newer and more exotic motors and gearboxes have been squeezed into the straightforward Seven chassis. And when you consider how much fun a simple 125hp Fiesta motor can be just imagine upgrading that motor to a 175hp 2.0-litre Duratec. That's an R300 which is pretty bloody lively by any stretch. 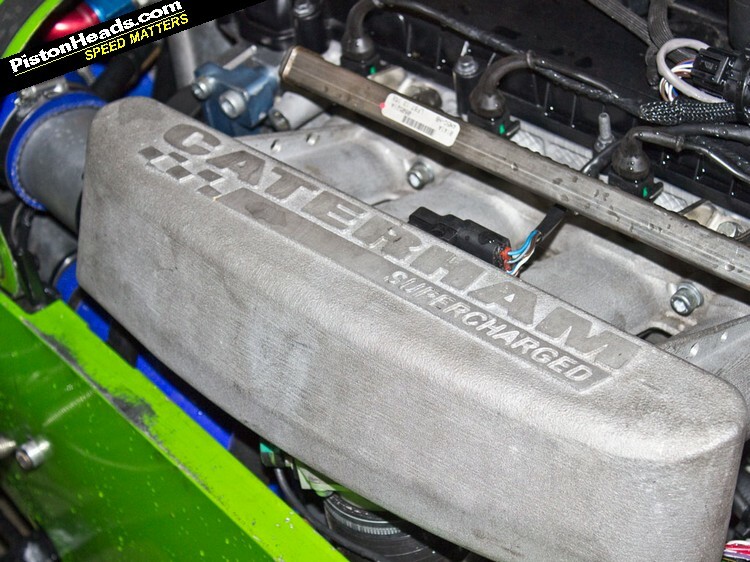 Then bolt a supercharger and another 85hp on to that. Now with added supercharger, gulp! The results are simply spectacular. 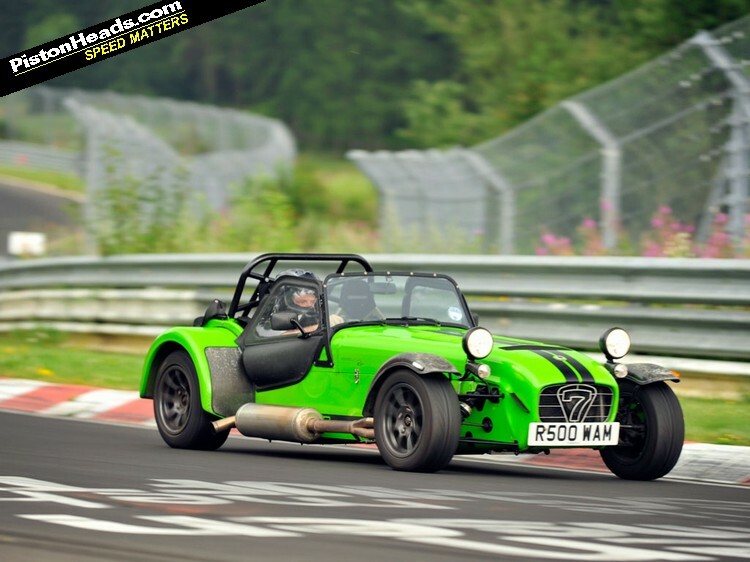 Acceleration of this R500-badged test mule is absolutely absurd, as many supercar drivers from this weekend's Nurburgring tourist sessions will attest. On paper the car should enjoy exactly the same performance as when it had the naturally aspirated 263hp motor. But the reality is that the performance is even better. For a start, the power delivery is more linear, with more torque provided in an easier to control fashion. While the purist may lament the loss of the soulful, higher-revving motor, it's really a needlessly melodramatic twinge. Silenced by the noise of this blown Duratec bouncing off the guardrails with the kind of ferocity that only comes from forced induction. It's the sharpness, the crackle, that gives it away. Because it's a centrifugal supercharger, there's no characteristic whine or howl. 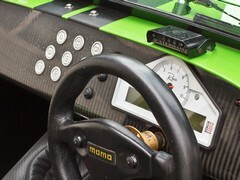 There's no lack of response to the loud pedal either, with reactions sharp enough to match the chassis in every respect. 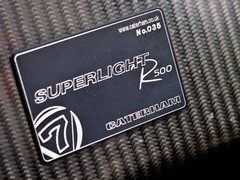 And, to be honest, the way the power chimed in on the R500 made it a bit of an oversteery monster near the limit. But with this car the gas pedal can be depressed so perfectly in line with the desired amount of drive that oversteer and neutrality are just a couple of millimetres apart, yet they still feel comfortably separated. Out on the 'ring, blitzing through the Sunday traffic like a shark amongst whales, the supercharged R300 only wants for a couple of improvements, a longer final drive one of them. This car tops out at only 130mph, a speed which can be reached in some really silly places with this much power in a 506kg car. For you 'ring anoraks, what about the jump before Flugplatz? Rev limiter in top. Pflanzgarten One? The same. Luckily, this being a prototype, it won't be long before that 3.83 diff is bolted on for a 148mph top speed. 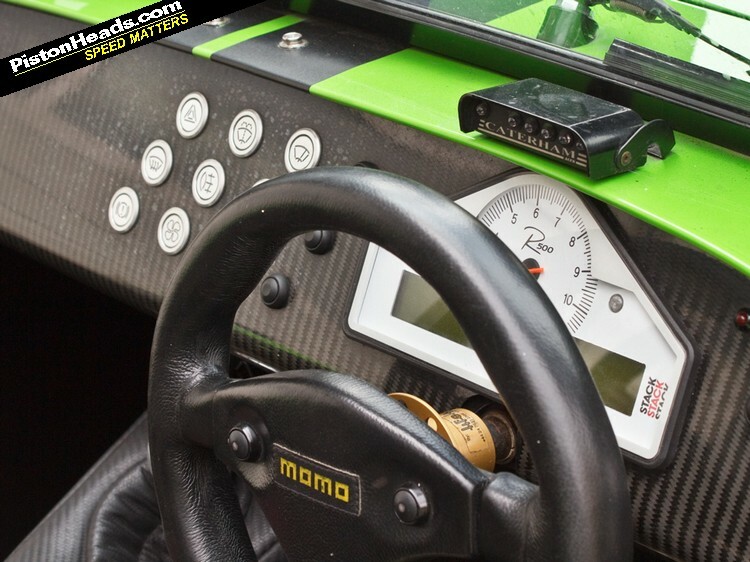 And maybe a bespoke sequential gearbox too. Right now it feels almost impossible to change gears fast enough to keep up with the engine in the first three gears. 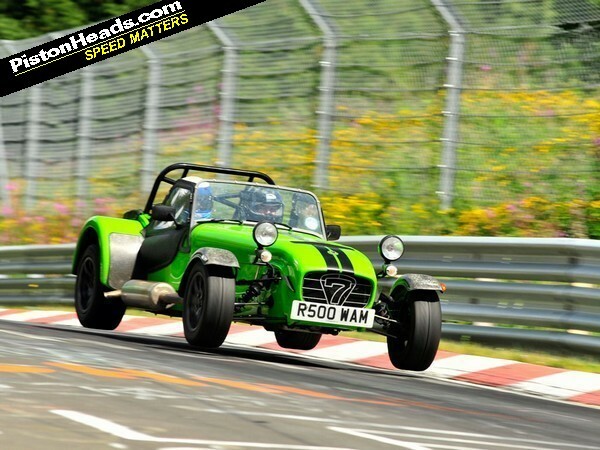 My orders from Caterham are to pull no punches, and give the car a merry pasting around the Nordschleife. The addition of the intercooler above the radiator looks a little odd, but the Stack digital display is set to report the water and oil temperature prominently, and both never budge. That's despite it being one of the warmest days of the year with temperatures in the mid-to-high 20s around the track. I keep pushing for three circuits, and I'm rewarded with some of my most entertaining laps to date. Then the day job gets in the way, and I have to return to the office and hand it over to my boss for another dozen or so laps with no problems. Not that there should be, the car having been pushed hard around roads and racetracks all over Europe so far. Officially, the car was being passed under the noses of current race teams over the weekend, with a view to proving to them that this concept is what they want to race next year. But I can't help but feel there's more to those misplaced R500 stickers than a convenient donor car ... a sequential 'boxed, supercharged Seven with a 'built' 300hp motor? Wouldn't that be about 600hp/ton instead of 500? Track shots by Jorg Jakowski of ring-bilder.de. Dont want to sound ghey or owt but I'd rather an R300 with fast road set up. That thing sounds like it has too much power for the average driver to exploit and enjoy and you'd be constantly wondering when it was going to get bored of your driving and decides to kill you to break up the boredom.